Is the Guardian resorting to using underhand means to boost its beloved Lib Dems and damage Labour in the eyes of its centre-left readership in the run up to the next election? Oops! Guardian accidentally gets a headline wrong about the Lib Dems. Again. The only problem is that it’s completely untrue. In his Huffington Post article, the Romanian ambassador doesn’t mock the ‘UK MPs awaiting arrival of migrants’ – he mocks the UK media waiting at Luton as well as right-wing politicians in general for their anti-immigration hysteria. He’s not referring to Labour MP Keith Vaz at all – who has been rather critical of anti-immigration rhetoric. So the Guardian’s lying. Again. And since it’s been revealed (by me mainly) that Private Eye editor Ian Hislop is also a secret Lib Dem fan, there seems to be a dearth of anti-coalition supporters in the UK press. Well that’s a surprise, isn’t it? The Guardian do some Stirling work for the centre left. But since the centre left, including Labour have washed their hands of working class people, many of whom tend to read the tabloids, its only fair they have a go at tying to improve the odds on their horse by massively hyping its form. Good work Mr Pride, but be careful to cast your satirical eye widely. We need to get the working class majority out to vote. That starts with having a party that speaks for them, which at the moment, looks like UKIP or the BNP. Public propaganda enemy no. 1 is the BBC followed by the Murdoch press. Politics needs to step away from Top of the Pops and move onto the rave scene and get edgy with the under 30’s.on you tube and social media. We need an army of Tom Prides and Owen Jones plus a few militants on line. We need houses and jobs and a future for our young generation, most of whom have never heard of Polly Toynbee. What do you reckon Tom? Very upset about the Guardian which I’ve read for years I stopped during the last election but I really didn’t expect them to support the Libdems again not after their complete sell out of principal. There are some great people writing for the Guardian but the general tone is becoming more Libdem. I don’t buy it every day now and I doubt I will buy it again. Drew – I have a lot of sympathy with the argument that there’s nobody speaking up for working class people at the moment – and that’s the reason why there’s been so much support for EDL, BNP etc. I think we need more working class people in positions of power – in the media, in parliament and in business. Unfortunately I don’t see that happening any day soon in the UK. Owen Jones’ The Demonization of the Working Class is one of the most important books – ideas actually – I’ve read in recent times. The Guardian headline regarding the ambassador mocking MPs at airports didn’t seem to imply that there was mockery of Vaz. It was mockery of those MPs and right wing journalists who’d turned up to count the first wave in a flood of migrants.Vaz wasn’t one of them; his own specific reasons were clearly stated. I can’t see how this is supportive of the Libdems. On Hislop ; it makes sense of many of his assertions on Have I got news for you, and his appearance on Question time, if he likes the Libdems.He’s uncritically accepted the big lies about the economy and repeatedly spouted phrases like ”we’re bankrupt” etc. I didn’t say this is an example of the Guardian distorting the truth to support the Lib Dems – although there are links to two other recent examples where the Guardian has done exactly that – I said it’s an example of the Guardian deliberately distorting the news to damage Labour. 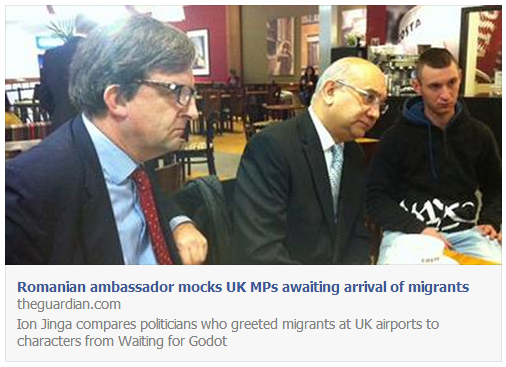 In this case, the Guardian headline “Romanian ambassador mocks UK MPs awaiting arrival of migrants” is not true. Or in other words it’s a lie. The next election will be fought across many battlegrounds – and one important one will be the battle for the centre-left vote in Lib Dem/Labour marginals. The Guardian is very well placed to influence those particular battles. They are also open supporters of the Lib Dems – so the question I’m asking is this: are the Guardian’s recent errors just examples of journalistic incompetence – or part of a bigger agenda? It’s a valid question to be raised on the Left I hope you will agree. Hislop ‘secretly’ supports the LibDems? Nothing much secret about it from my point of view, since he embarrassingly tried to get a round of applause for the Coalition during the HIGNFY just after its formation. The Private Eye cartoon strip about the Leader of the Opposition is also embarrassingly off form since they have gone for a one-note ‘Mr Millibean’ which means they can only depict Ed Miliband as a bumbling fool. ‘Ed Balls is fat’ seems to be the main joke in most editions. * The Guardian article says that the Huffington Post article had been amended to remove mentions of politicians. I don’t know if that’s true or not but it’s certainly worth mentioning. * It’s a popular misconception that anti-immigration rhetoric is solely peddled by right-wing politicians (note that the quote Ion Jinga refers to uses “populist politicians” not “right-wing”). Labour and Lib Dem MPs are not immune to stirring up fear, especially if it’s something that affects their constituency; Clegg and Blunkett have been at it in Sheffield, and it’s only 3 years since Phil Woolas’s infamous hate-stirring election campaign in Oldham. I don’t think the Guardian is doggedly pro Lib Dem; I don’t think Toynbee would stay on board if they were. The only reason they backed them in 2010 was because Gordon Brown was pretty much unelectable and it briefly looked as though the Lib Dems would pick up a lot more seats than they eventually did. I’d be surprised if the Guardian doesn’t support Labour in 2015. The mention of a change to the Huffington Post article by the Guardian seems to have been added later itself. I read the original Huffington Post article which did indeed mention politicians – he was referring to right-wing ones – but I presume the ambassador decided to change it after he realised newspapers like the Guardian were trying to use it to attack Keith Vaz. All these changes happened after I wrote this blogpost, perhaps because of it. Who knows? This shouldn’t be a surprise, The Guardian is part of the corporate media after all. If there is the slightest whiff that Labour would be ‘bad’ for business – and Ed M has made some promising noises re a living wage which might be a sign of things to come… – then the Guardian will try and protect its corporate interests while still trying to pass itself off as la paper of the left. If it comes out openly for the Lib Dems it will become a laughing stock to its readers given how craven and dishonest the party has been since abandoning everything they purportedly stood for to get a very slight taste of power. The Independent is probably the most honest paper out there today and it isn’t littered with pious, mimsy faux-left twerps like Polly Toynbee. The Lib Dems may have meant well, but to me they are traitors as all the unpopular, unpleasant Tory laws that have come have only come because of them. They deserve to be lowered to a shrivelled remnant of what they used to be. So too are the shadow cabinet of the new labour party.